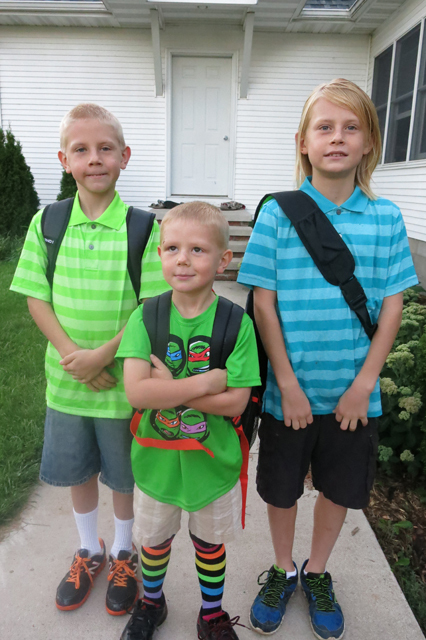 Liver transplant | life with three boys and a splash of purple! On the first day of school, Nola Mae and I took a bike ride to town to run errands. I needed to do lots of things this day, grocery shopping, library, bank, post office, drop something off at school and most importantly get exercise and get away from the house so I wasn’t thinking about missing my boys. 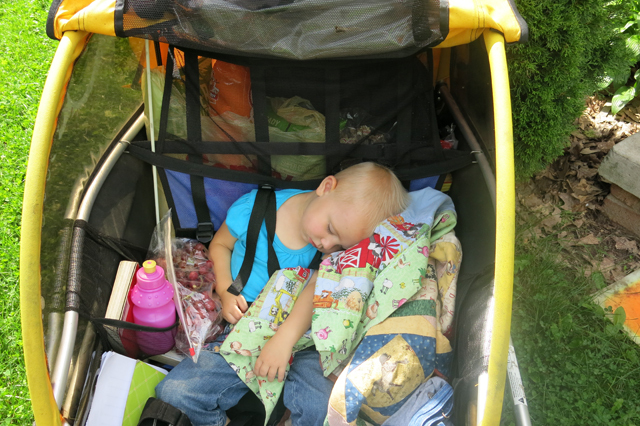 Our way home was a lot of work for me…27 pound child, 15 pound bike trailer, 75 pounds of groceries and library books. 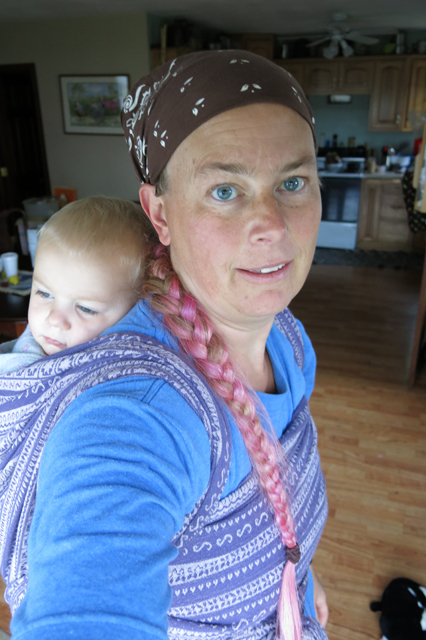 I have planned to dye my hair a non-traditional color (purple) for many months. I finally got around to doing it and it faded to pink (not one of my favorite colors). In the last month I have considered chopping my hair just twice to get rid of it. When my mom first saw me after I dyed my hair, she joked with me that my fabric dyes got in my hair. Now, I am feeling like I will keep it for a while. Next, I will attempt purple and maybe more colors. 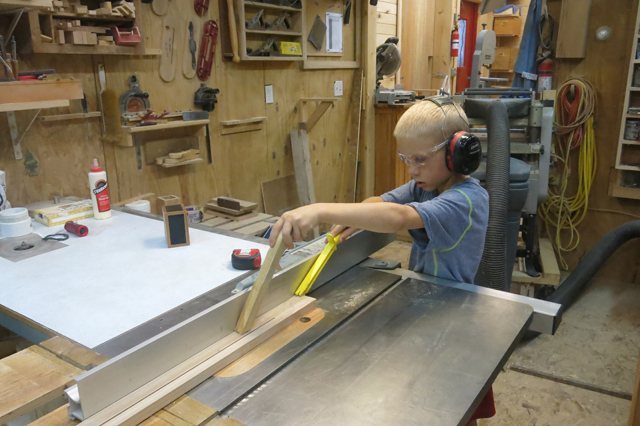 Jack has made many cigar box guitars in the last year. 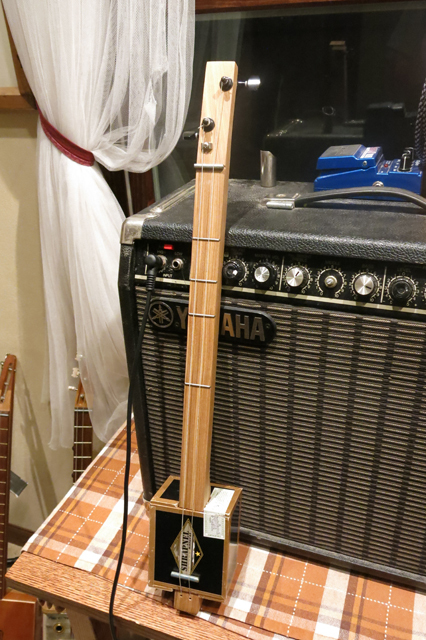 This month Charlie finished a two string cigar box guitar. 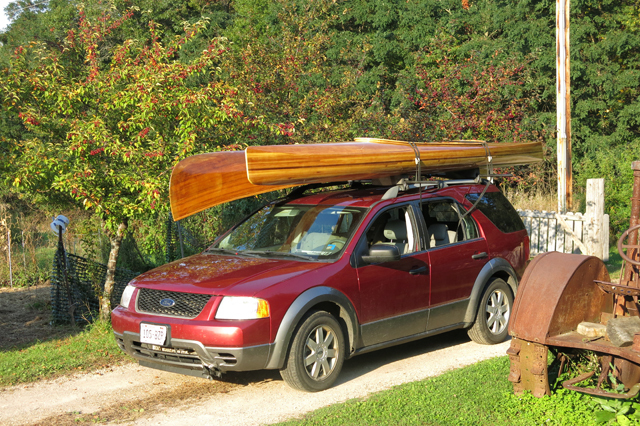 I have an amazing husband, he deserves a blog post all to himself. He is talented in many areas, he is intelligent, he is teaching our kids many skills, he creates beautiful wooden furniture and boxes. 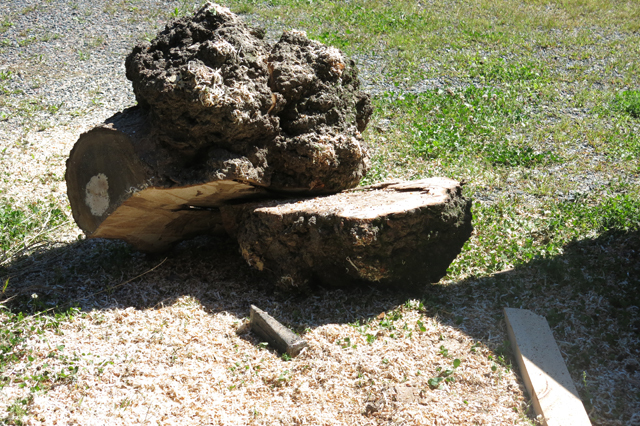 I was a little skeptical about these ugly pieces of wood when he loaded these into our car. 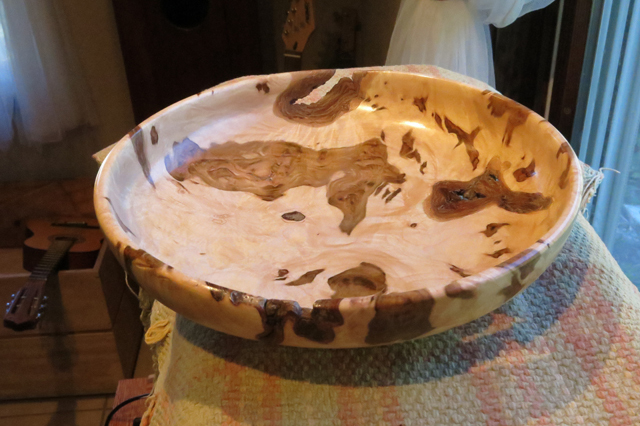 One day he handed this beautiful bowl to me and told me he made it from the wooden burrows that we brought home. Charlie turned a bowl with Jack. He took his unfinished bowl to school to show his teacher. Charlie was eager to finish it and then took it back to school. One day I was looking for Charlie’s bowl to take a photo. He told me he gave it to his teacher. 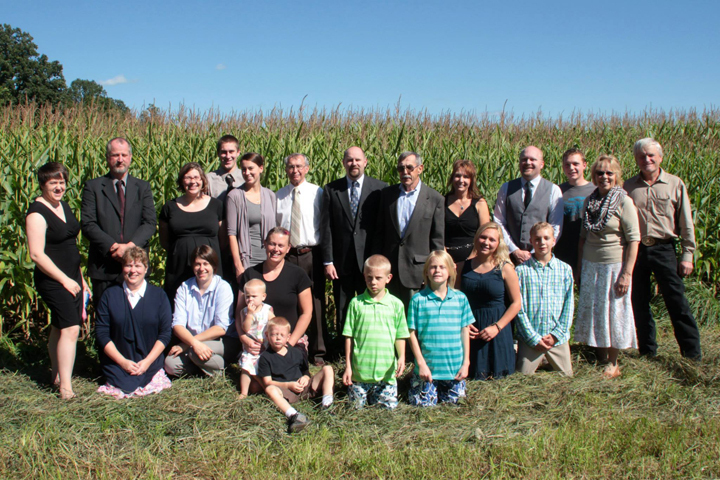 We got together with all the Vater cousins this month, unfortunately because Grandpa Neil passed away. 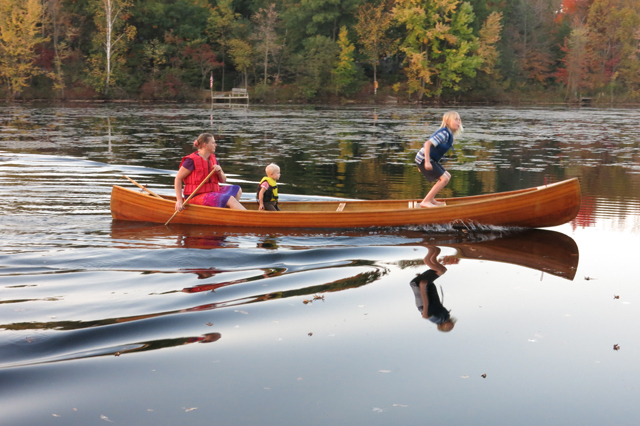 It was wonderful to see our kids having a blast with their cousins, and visit with the cousins we don’t see very much. 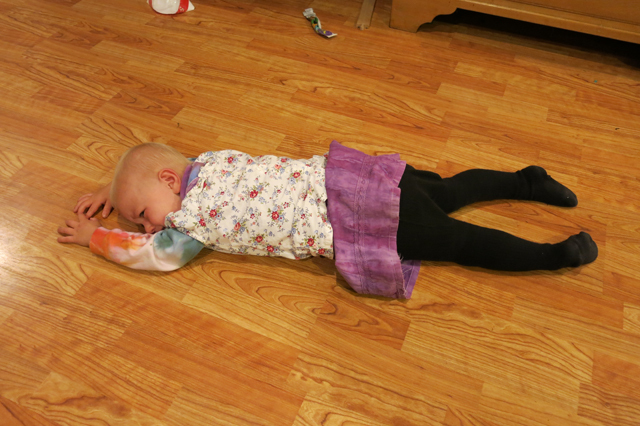 Nola Mae and I missed out on the last family gathering because she was sick. 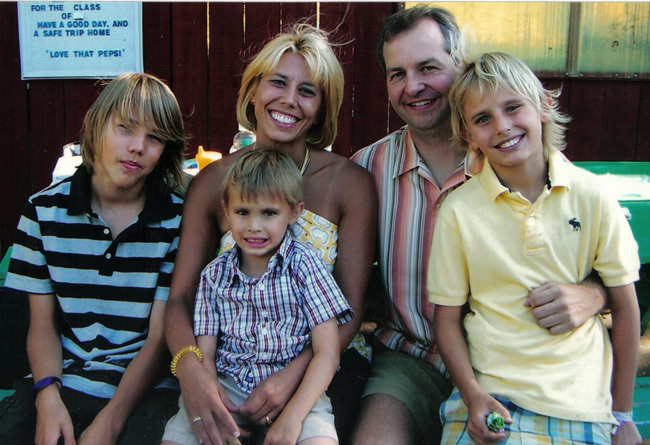 I am not interested in doing the math on when I last saw Jack’s cousins from CA, it was sometime when Ben was still a little boy. When Ben opened his mouth I just about died, because he had a man’s voice, not a little boy anymore! Ben is the tallest man in the Vater family. I have many sisters, four of them, all of them are amazing in their own way! Early this month, Becca completed her first Ironman in Madison, 2.4 mile swim, 112 mile bike, 26.2 mile run. I wasn’t able to make it to Madison to cheer her on. 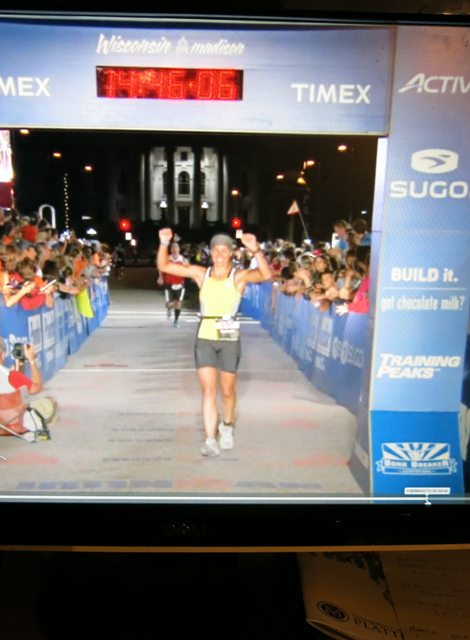 I was able to watch her finish from the comforts of my home, 130+ miles away on my computer through the live-feed video on Ironman’s website. I have my very own finish line photo of her. Nola Mae loves to put clothes on, take them off, and put extra layers of clothing. 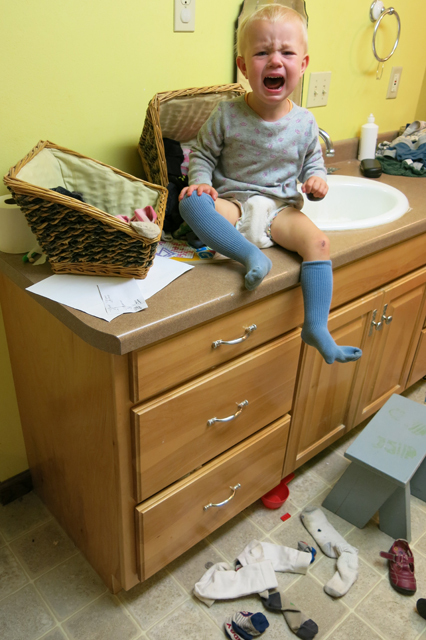 While I was taking a shower Nola Mae climbed on the counter and was putting socks on and taking them off. I took this picture with the intention of doing a blog post with all the photos I have collected of her in her many outfits. 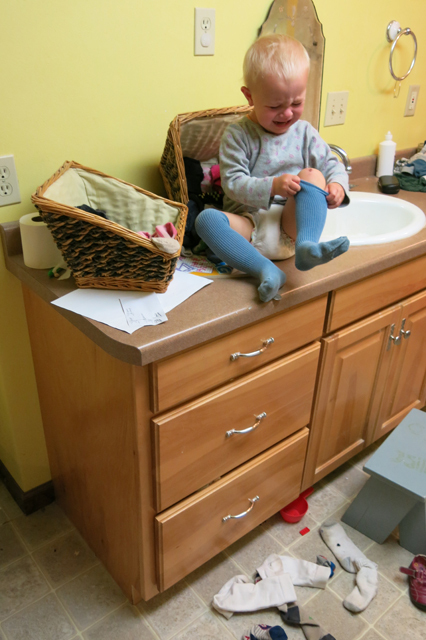 Two days later…there was an outfit that included many layers and many tears – three shirts, one dress and one pair of tights – she wanted more clothes on and I wouldn’t help her. The above photos aren’t so pretty ones of Nola Mae, but this one is! 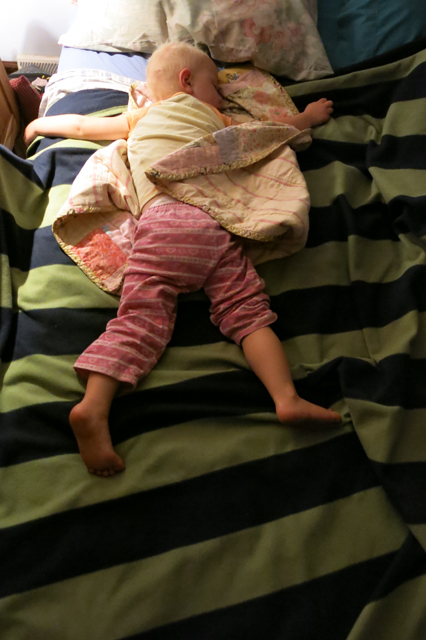 When you co-sleep and put your child to bed before yourself they claim their spot. I knew Henry was outside on the deck. I heard sounds of a trombone. I was afraid he snuck Robbie’s trombone upstairs and outside. 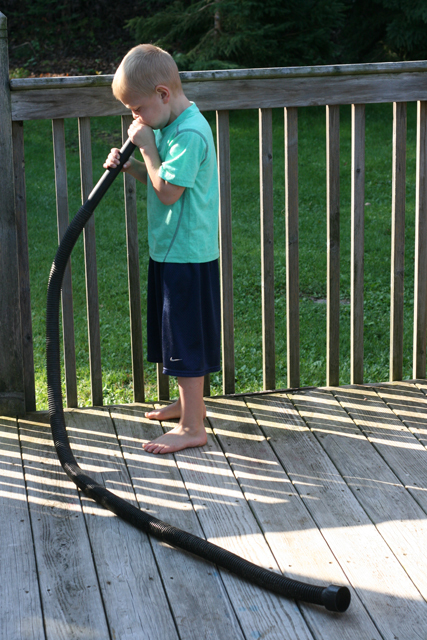 I was relieved, happy and very excited to see him making music with the vacuum cleaner hose, rather than the $754 trombone! 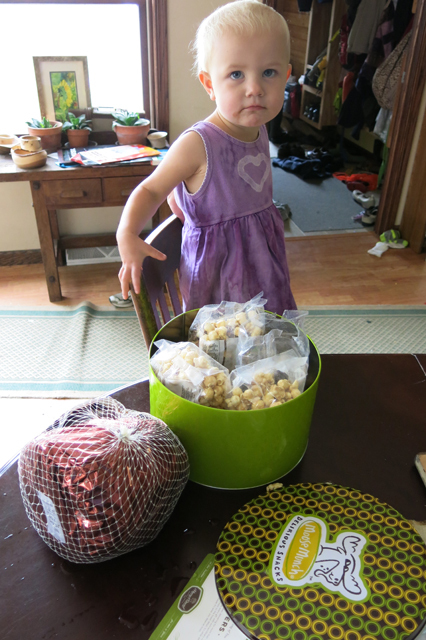 Four days before my birthday a wonderful gift arrived at our house – a spiral ham and caramel popcorn! I was delighted, ham is one of our favorite things. Especially, mine because one ham goes a long way here. If I am remembering correctly this ham gave us at least four meals, fillings for additional meals, made awesome snacks and were added to cold lunches for boys. The very last of this ham will be eaten sometime this fall when I make my favorite soup! On September 11th, Nola Mae and I drove to Milwaukee to see my sister, Emily. Earlier in the week she was admitted to the hospital for liver failure and the talk was “she isn’t going home until she gets a new liver”. 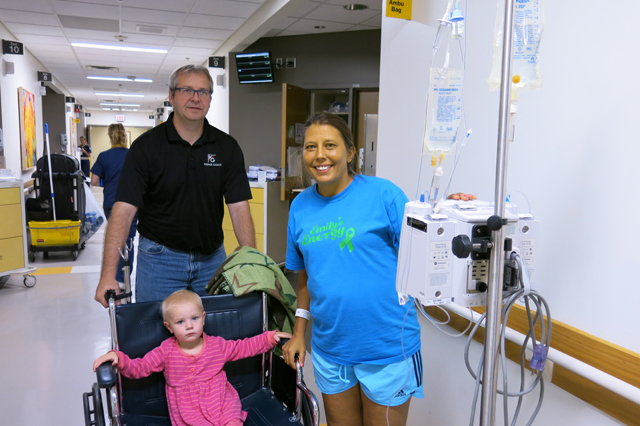 Her MELD Score was so high, she was on the top of the liver transplant list for the Midwest. As the week progressed and she got more fluids and antibiotics she was feeling and looking better. I was thankful to see her in better spirits and health later in the week so that when and if a new liver came to her she would be strong enough to make it through a transplant. On Monday, September 15th, around 4:30 AM Emily was told that there is an organ donor who is a perfect match for her. I am pretty sure this was the longest day in her entire life. It sure was for me! 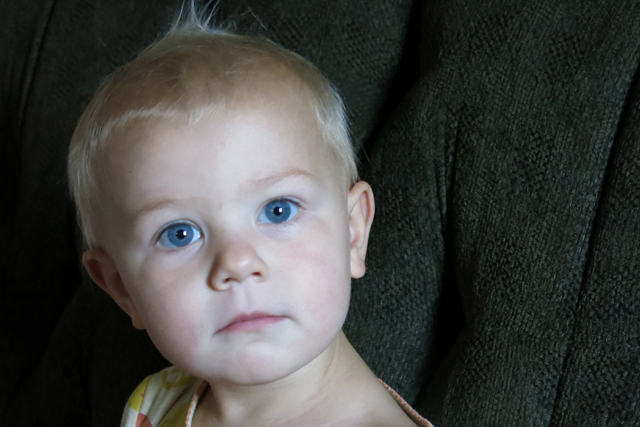 The staff took her to surgery for the liver transplant at 5:30 PM. If I am remembering correctly, I got the call at 12:21 AM, on the 16th, telling me that her surgery was done and she will be heading to ICU. Click here to read my thoughts on the day of Emily’s transplant, “A Sister’s Emotions”. I spent the day before my birthday glued to my computer and close to the phone waiting for any news on Emily’s transplant. I didn’t get much sleep that night and woke up for my birthday in a zombie-like state. I knew Emily was sedated, well cared for in ICU and I needed to get the heck out of my house! IT was MY birthday and I wanted my special coffee and I wanted to use my 60% & 50% off coupons at JoAnn Fabrics! So Nola Mae and I went to town! I made a trip to my favorite thrift store and found a bunch of dye blanks! I bought these fabrics. The birds and butterflies were on the $4/yard rack. 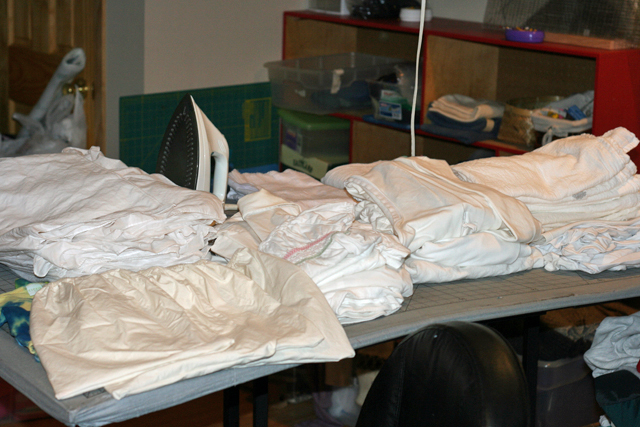 The bottom white fabrics I bought for making dyed scarves. 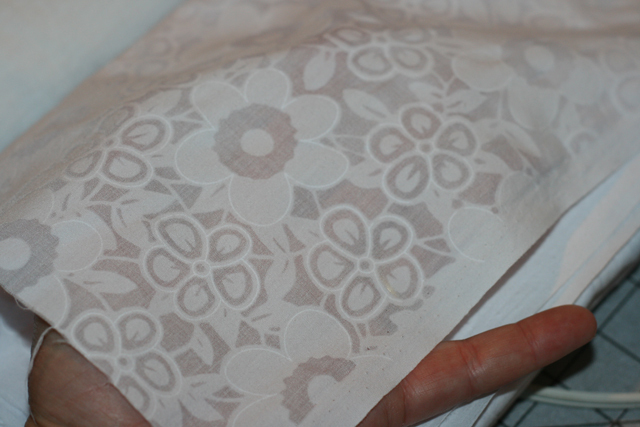 A close up of one of the white fabrics. 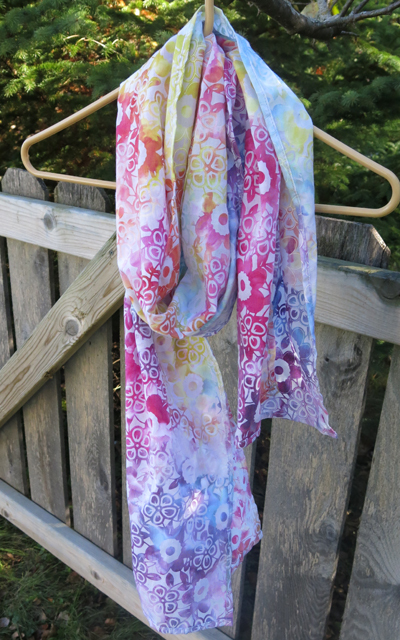 I made two scarves from this fabric – one for my step-mom and one to sell or give away as a gift (or maybe keep for myself). 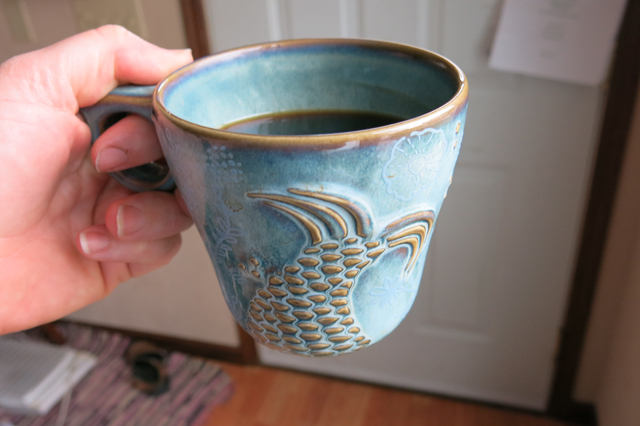 My last stop in town was Starbucks, thanks to my sister Danna and her boyfriend, I purchased a yummy coffee and this beautiful coffee mug. 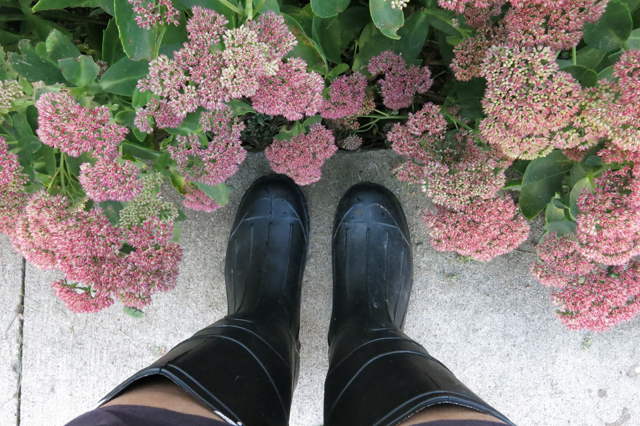 The boys (& Jack) gave me a package of socks, these awesome rubber boots and something else. I can’t remember what the third thing was. I love my new boots and wear them every day! Usually my garlic gets planted in October. 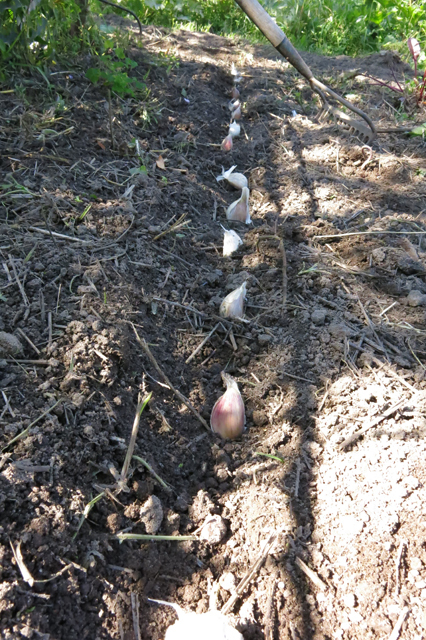 The planting window for garlic in Wisconsin is mid-September to November. I remember this because my birthday is the beginning of this planting window and my brother’s birthday, which is at the end of October, is my absolute last day for planting garlic. This fall, I started planting my garlic before my birthday and then finished planting 200+ cloves of garlic the day after my birthday. 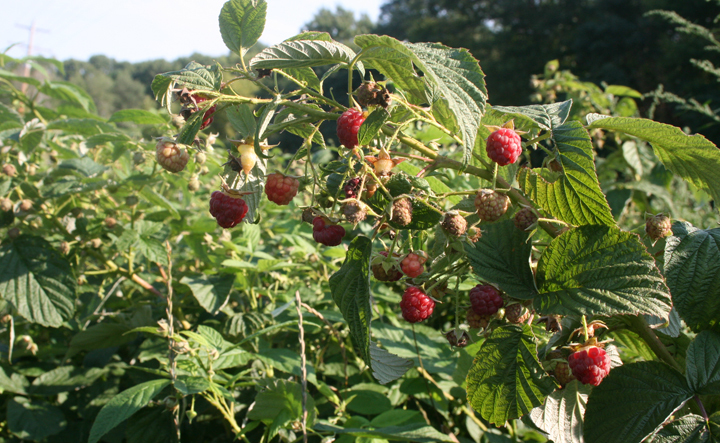 We are were still picking raspberries into October. 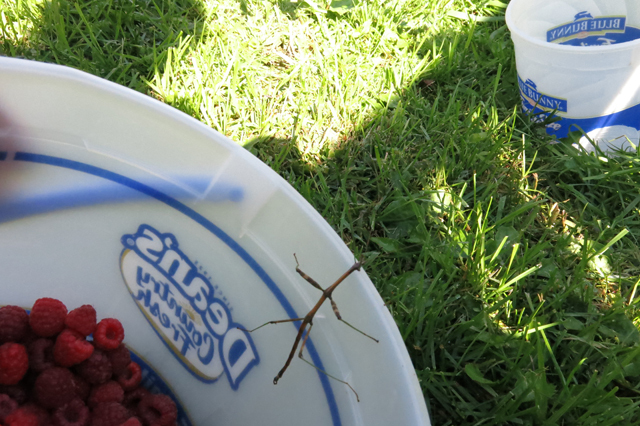 Every year I find a pair of Walking Sticks in my raspberry patch. They are always attached to each other every time I see them. This time I happened to have the camera with me and when I bumped them, they came apart and I took this photo. 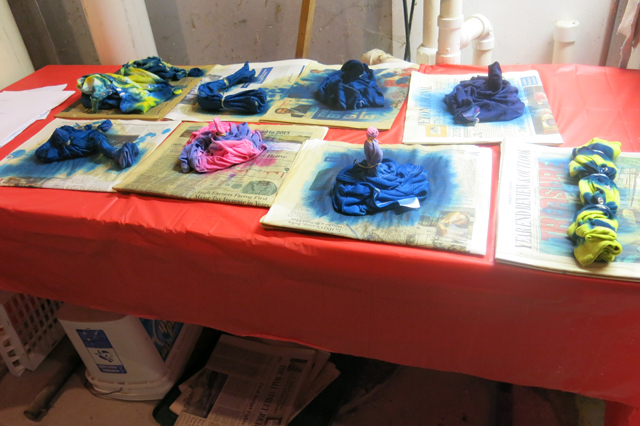 I also had some time to set up a little dyeing space in my basement and got busy. In one week I dyed 20 pieces. 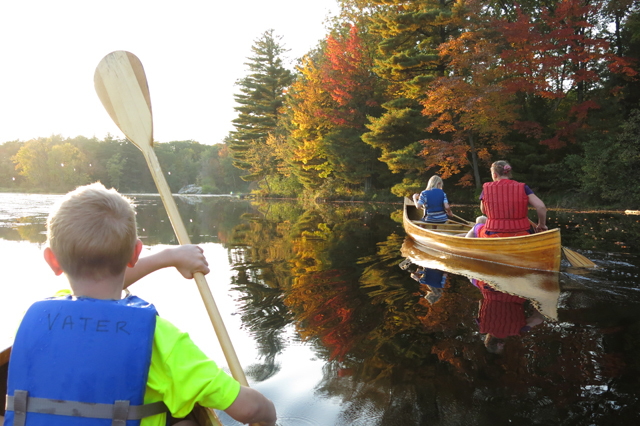 We paddled up the river from Big Falls when the leaves were beautiful. It was a great way to end the month. 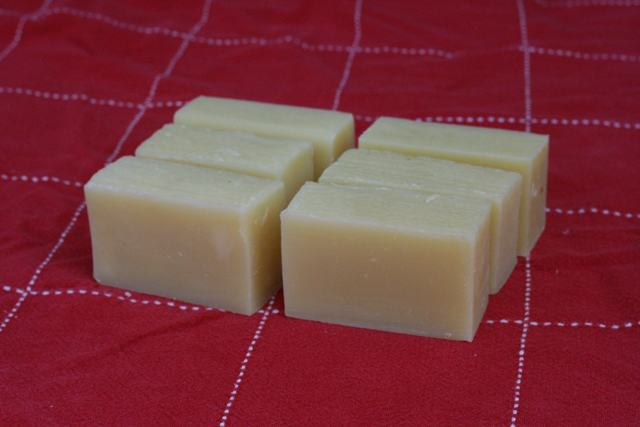 I am making and selling soap again this year. I started early for Christmas by making four batches. 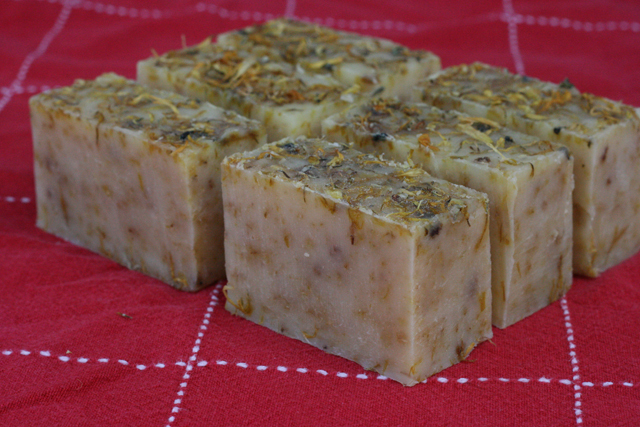 “Cleansing Calendula”, with essential oils: Lavender & Tea Tree and ground Calendula flowers for a great exfoliation. Aroma: Soft, floral. 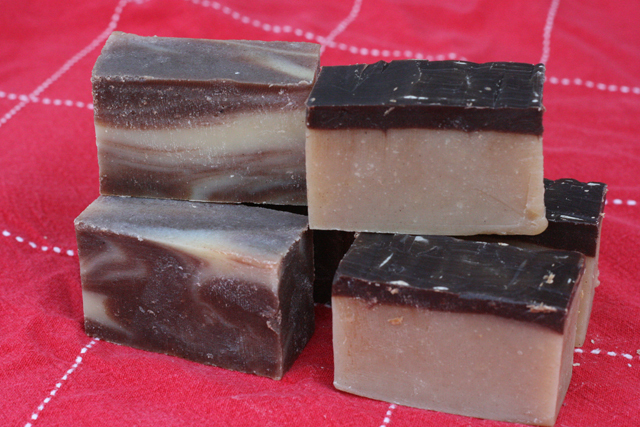 Benefits: Renewing, cleansing, stimulating. “Jumping Juniper” essential oils: Juniper, Lavender & Rosemary Aroma: Floral Benefits: Restoring, empowering, balancing, purifying, & uplifting. 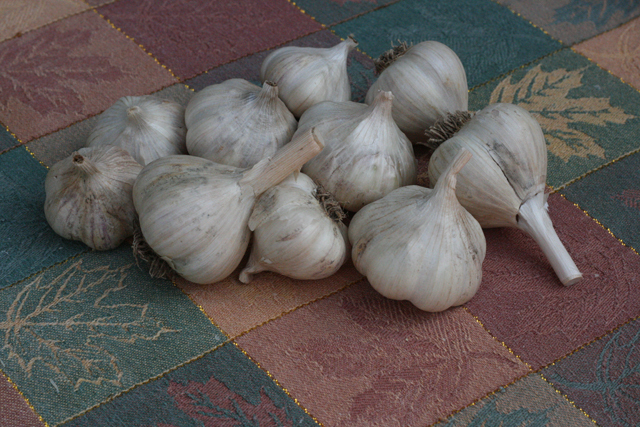 I have about twelve pounds of garlic to sell. It was a good birthday month for me! This morning at 5:30 I woke up to the phone ringing and then the answering machine picked it up. This was the first night in almost a week that I wasn’t sleeping with the phone next to me. I knew it wasn’t for Jack because the person talking was going on and on – not the typical early AM call we sometimes get, “Jack, I do not need a ride today.” from Jack’s friend and co-worker who he rideshares with. Instead it was my sister telling me there is a liver match for her. I was wide awake and afraid to get out of bed to listen to the message. I still haven’t listened to it. I got out of bed and called my sister back right away to hear it from her. Why are my feelings so negative when everyone who is replying to the news is so excited and happy? Another family will have to suffer the loss of a loved one to help my sister live. I know, a precious gift of organ donation is priceless, incredible and unbelievable. A gift, I would not hesitate to give if my family was put in the same situation. I am sad that this has to happen to someone and someone else’s family. I am thankful people are organ donors and I will be eternally grateful to this one special family that saved my sister’s life. Sending positive vibes to my sister. Hugging my sweet little girl who wants to hug me and wipe away all my tears while I cry today. And I may just clean my house, just like Emily would (AKA “the white tornado”). With my birthday coming up I get frequent questions from my husband about what we could do for my birthday and is there anything special I want for my birthday? He is great, no guessing and all expectations are expressed. 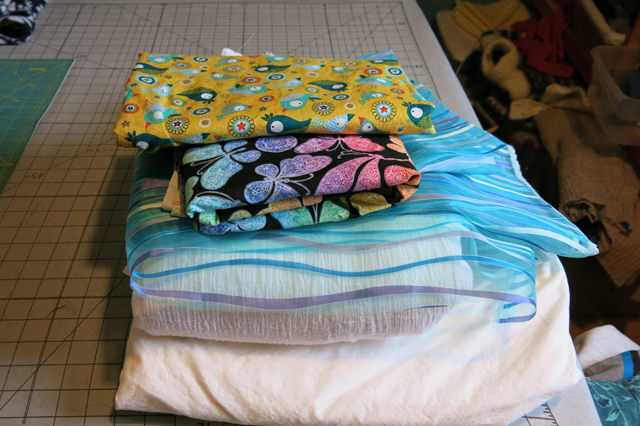 My wishes usually involve not having to cook dinner or a paddle or time alone in the sewing room. I don’t spend any money on myself, ever, unless it is around my birthday. That is when I may buy a yummy coffee from a coffee shop or new socks for myself or a yard of fabric I have admired (and only if I have a coupon). My life is simple and I am happy. Last week when I was praying for my sister to make it through this, it occurred to me that the only thing I wanted for my birthday was for her to have a new liver. Tomorrow is my birthday. It is 6:00 PM and Emily is headed for surgery now. Please help me pray for my sister and her doctors and for the grieving family.